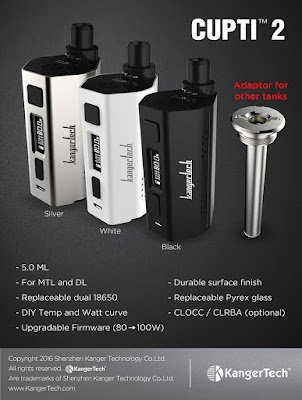 Kanger Cupti 2 is a new all-in-one device designed by Kangertech, it can fire up to 100W power output and both suitable for Mouth to lung and Direct lung vapers. With the 5.0ml built-in tank and adjustable airflow system, it's easy to operate without leaking problems. Also supports Nickel 200, Titanium and Stainless Steel atomizers in temperature control mode, can compatible with CLOCC atomizer and includes (1) SS316L 0.5ohm atomizer head for direct lung users.